This post is excerpted from the essay "Syria" by Paulo Gabriel Hilu Pinto, which appears in Dispatches from the Arab Spring (UMP, 2013). A long history of resistance and opposition to the Baathist regime existed in Syria before the uprising that began in 2011. While both secular and religious political movements had tried to counter the control that the regime had imposed on Syrian society since 1963, Islamic groups, such as the Muslim Brotherhood, managed to attract militants from the traditional elites and the urban middle classes into confrontational opposition to the regime. From 1979 to 1982 various Islamic groups under the leadership of the Muslim Brothers had waged an armed struggle against the Baathist regime (Abd-Allah 1983). During the 1970s the grievances of the traditional landowning and industrial elites and of the professional middle class found expression through the idiom of political Islam, as all secular political forces had been disbanded by the Baathist regime. Several Islamic groups were created, but the Muslim Brotherhood was the largest. The society of the Muslim Brothers in Syria (al-Ikhwan al-Muslimun fi Suriya) was created in the 1940s with the reunion of preexisting Islamic organizations under the leadership of the Syrian sheikh Mustafa al-Siba‘i, who had come into contact with the Muslim Brotherhood in Egypt while he was a student in Cairo. Like their Egyptian counterparts, the Syrian Muslim Brothers were committed to the creation of an Islamic state, but unlike the Egyptians, they had a strong presence among the members of the religious establishment, such as Sufi sheikhs and ‘ulama, who mobilized their followers into the political project of the movement. The ideology of the Muslim Brothers recruited adepts among the urban middle class of merchants and professionals. The Islamic opposition was particularly active in Aleppo and Hama, where some of the religious leaders had family connections with the traditional urban elites of merchants and landowners, as well as a strong appeal among the middle classes and some popular sectors (Abd-Allah 1983; Batatu 1988; Carr. and Seurat  2001). The conflict with the state culminated in a military confrontation that destroyed a large part of the city of Hama in 1982 and resulted in an enormous number of casualties among the civilian population. After the tragedy of Hama, political Islam declined as a mobilizing force in Syrian society, and Hafiz al-Assad’s government adopted a more accommodating stance toward Sunni Islam. 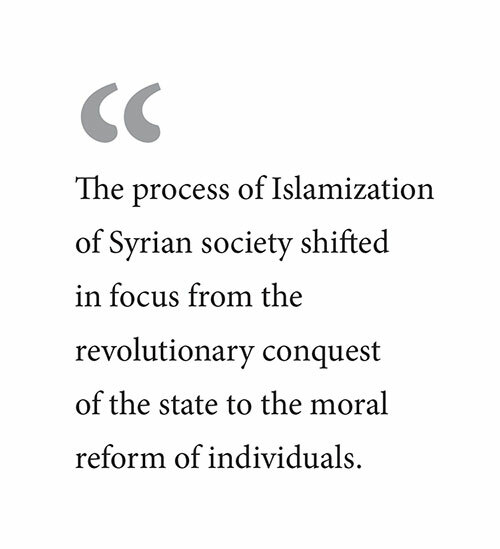 Hence the process of Islamization of Syrian society shifted in focus from the revolutionary conquest of the state to the moral reform of individuals, a tactic that could be said to have been largely successful by 2011 (Pinto 2007b). Efforts to create an “Islamic society” became centered on the production of pious individuals through their engagement in religious education, religious practice, and moral behavior. The traditional religious authorities, such as the ‘ulama and the Sufi sheikhs, were the main promoters of this process, for they already understood the reform of individual behavior as a tool for changing and shaping society within a framework of Islamic values. The accommodation between the Baathist rule and the growing public affirmation of Islam in Syrian society allowed the establishment of governance through negotiation and co-optation of social groups, which translated into a period of relative political stability for the regime. Within the same logic, the mobilization of Islamic vocabulary and symbols during the anti-Baathist uprising reflected the importance of Islam as a cultural idiom for the insertion and positioning of individuals in the public sphere, rather than the presence of organized Islamist movements. Therefore the protesters used religious references in their critique of the regime not because they belonged to Islamic political organizations but rather because Islam had become the major cultural framework for the affirmation of social ideals during the previous three decades in Syria. The rise of Bashar al-Assad to the Syrian presidency after the death of his father, Hafiz, who ruled Syria from 1970 to 2000, consolidated the grip of the Assad dynasty over Syrian politics. This power transition produced a “dynastic republic” (which its opponents ironically called a jumlukiyya), a model that was eagerly copied by other authoritarian regimes in the Arab world. The dynastic succession also signaled the intensification of the concentration and personalization of power within the Baathist regime. This process started under Hafiz al-Assad’s rule, as he gradually neutralized the Baath Party and other institutions such as trade unions and peasant organizations, depriving them of any coherent ideological content or political power within the structure of the regime (Le Gac1991, 135–36; Perthes 1995, 133–202). Already in preparation for the dynastic transition, Hafiz eliminated all centers of power within the regime that could threaten its course. In 1998, Rifa‘at al-Assad, Hafiz’s brother, who had been in exile since his frustrated coup in 1984, was stripped of his symbolic position as vice president. In 1999, the network of legal and illegal business in the port of Latakiya that had been controlled by Rifa‘at was dismantled, and groups of his loyalists were disbanded after they took part in armed confrontations with the Syrian army throughout the city. Similarly, ‘Ali Duba, chief of the military intelligence services, was dismissed from his post because he was perceived as being a potential threat to Bashar’s ascension to the presidency. 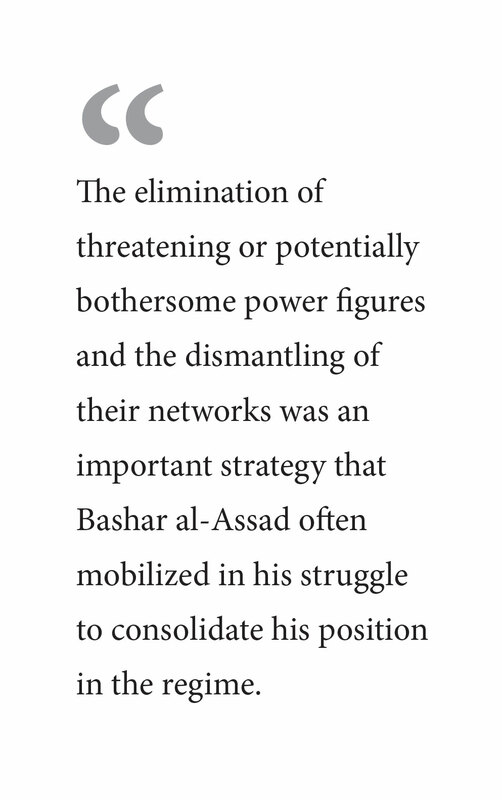 The elimination of threatening or potentially bothersome power figures and the dismantling of their networks was an important strategy that Bashar al-Assad often mobilized in his struggle to consolidate his position in the regime. This affected even high-profile figures from Hafiz al-Assad’s era, such as Mustafa Tlas, minister of defense, and ‘Abd al-Halim Khaddam, former foreign minister and vice president, both of whom were highly instrumental in assuring Bashar’s ascension to the presidency. In this way, there was a gradual concentration of power in the hands of the president and his allies, and only the networks of patronage and clientship directly connected to them were allowed to survive (George 2003, 64–81; Donati 2009, 129–60). Beyond the power disputes within the regime, Bashar al-Assad tried to gain political legitimacy by presenting himself as a leader committed to political reform and the economic modernization of Syria. While in the political realm the reforms were fast and ephemeral, they allowed the emergence of a public debate on democracy and political freedom that had some impact on the political idiom of the current protests. The recognition by Assad, in 2000, of the necessity of social dialogue and debate on political, economic, and social matters unleashed a vast drive toward the organization and institutionalization of a multiplicity of social and political movements. Soon, clubs and circles of debate were organized throughout Syria in what was locally known as the Civil Society Movement (Harakat al-Mujtama’ al-Madani) and internationally called the Damascus Spring (George 2003). However, already in 2001, repressive measures started to be directed against the leaders and participants of the Civil Society Movement. They were, in general, intellectuals from the traditional urban elite and the professional middle classes, mainly from Damascus, who had a very narrow social constituency and few channels of dialogue with other potential forms of opposition to the Baathist regime, such as Islamic or ethnic organizations. By 2002, the movement had already been crushed, although its leaders continued to be active as opponents to the regime (George 2003, 30–63). In the economic realm, while the reforms had a slower pace, they were also more durable. Assad’s government launched the idea of a “social market economy” in order to make sense of the adoption of a neoliberal economic model in tandem with the continuity of state intervention in the economy. Therefore, state enterprises were privatized; private banks were allowed to function; new information technologies, such as Internet and mobile phones, became part of everyday life; and various sectors of the economy were opened to foreign investment. In theory, the social market economy, which was inspired by the Chinese model of state-controlled economic liberalization within the boundaries of an authoritarian political order, aimed to develop the commercial and industrial sectors in neoliberal molds without abandoning the Baathist politics of social equality promotion. In practice, it meant the development of capitalist economic sectors controlled by entrepreneurs who had connections to high levels of power in the regime (Aita 2007). Therefore, the reforms, instead of producing greater economic dynamism, created new networks of corruption and patronage and intensified the predatory grip of those networks on Syrian society. Not that corruption was foreign to the Baathist regime. On the contrary, various forms of corruption constituted a diffuse mechanism of negotiation and co-optation between the state and discrete social groups and agents that was central to the construction of the Baathist governance of Syrian society (Perthes 1995, 181–87). What happened under Assad was the centralization of the networks of corruption and patronage within the circle of the president’s allies, so that enormous amounts of resources were channeled into their hands. Paulo Gabriel Hilu Pinto is professor of anthropology at the Universidade Federal Fluminense, Brazil, where is is also director of the Center for Middle East Studies. He has conducted fieldwork in Syria since 1999 and with the Muslim communities in Brazil since 2003. 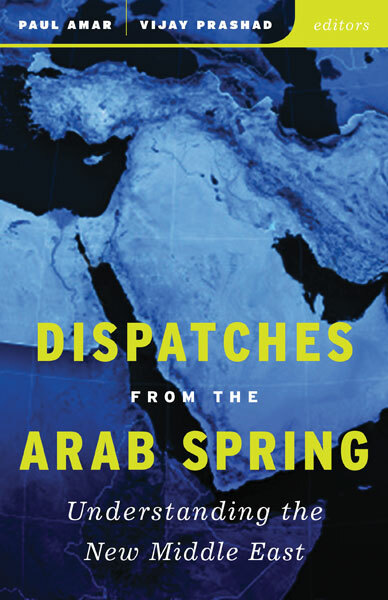 His full essay "Syria" can be found in Dispatches from the Arab Spring, edited by Paul Amar and Vijay Prashad. 1. Sufism is the mystical tradition in Islam. It is organized into various esoteric traditions of "paths" (tariqa; plural turuq) that are transmitted through a process of mystical initiation of the disciples by their masters, who are those who have already been successfully initiated by other masters, becoming Sufi sheikhs. The social expression of Sufism involves communities, each of which is organized around a charismatic leader, the Sufi sheikh, who is the main religious authority for his followers and disciples. In Syria, Sufism is an integral part of Muslim religiosity, with a large proportaion of the nation's religious leaders being initiated in Sufism and acting as Sufi sheikhs for their communities (Pinto 2007a). 2. Estimates of the number of deaths range from five thousand to twenty-five thousand (Van Dam 2011, 111). 3. Ironically, the rejection of this dynastic model of authoritarianism was one of the mobilizing factors in the revolutions and uprisings that took place in Tunisia, Egypt, Libya, and Yemen. The term jumlukiyya is a neologism created by the fusion of two Arabic words: jumhuriyya (republic) and mamalukiyya (kingdom). 4. A Kurdish political militant from Aleppo told me in 2006 that the Kurdish party Yekiti tried to forge an alliance with the leaders of the Civil Society Movement, but their refusal to incorporate Kurdish demands of cultural recognition into their political project led to the eventual failure of this initiative. -Abd-Allah, Umar. 1983. The Islamic Struggle in Syria. Berkeley, Calif.: Mizan Press. -Aita, Samir. 2007. "L'Economie de la Syrie peut-elle devenir sociale? Vous avez dit economie sociale de marche?" In La Syrie au present: Reflets d'une societe, edited by Baudoin Dupret, Zouhair Ghazzal, Yussef Courbage, and Mohammed al-Dbiyat, 541-88. Arles: Actes Sud. -Batatu, Hanna. 1998. "Syria's Muslim Brethren." In State and Ideology in the Middle East and Pakistan, edited by Fred Halliday and Hamza Alavi, 112-32. New York: Monthly Review Press. -Carre, Olivier, and Michel Seurat. (1983) 2001. Les Freres Musulmans: 1928-1982. Paris: l'Harmattan. -Donati, Caroline. 2009. L'Exception Syrienne: Entre modernisation et resistance. Paris: La Decouverte. -George, Alan. 2003. Syria: Neither Bread nor Freedom. London: Zed Books. -Le Gac, Daniel. 1991. La Syrie du General Assad. Brussels: Complexe. -Perthes, Volker. 1995. The Political Economy of Syria under Asad. London: I. B. Tauris. -Pinto, Paulo. 2007a. "Religions et religiosite en Syrie." In La Syrie au present: Reflets d'une societe, edited by Baudoin Dupret, Zohair Ghazzal, Youssef Courbage, and Mohammed Dbiyat, 312-58. Arles: Actes Sud. -Van Dam, Nikolaos. 2011. The Struggle for Power in Syria: Politics and Society under Asad and the Ba'th Party. London: I. B. Tauris.